The oh-so romantic Valentine’s Shrine. 1. Ski through the trees to the Valentine’s Shrine on Aspen Mountain (hidden in the woods on Walsh’s). 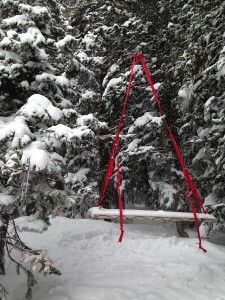 Created and maintained by locals, this romantic nook is identified by pink, red and white ribbons tied to branches and a swing suspended over the snow. Brush off the seat to read a quote from Shakespeare. 2. Clink with Veuve Clicquot this weekend at Aspen Oasis, the world’s first pop-up Champagne and caviar bar. (To find the secret setting, follow clues on The Little Nell’s Facebook, Instagram and Twitter accounts using #AspenOasis and #CliquotintheSnow.) And with the light lingering longer, the Silver Queen Gondola will be open till 4 pm starting on Feb. 14. 3. Allow our Clef d’Or-certified concierges to craft an itinerary for the entire day – from breakfast in bed to an adventuresome outing to fireside drinks in the Living Room to an en-suite massage, replete with flower petals from your door to the treatment table. 4. Request room service at The Little Nell with a sweet treat for two. Our pastry chef’s chocolate truffles are simply divine. 5. Savor a Five-Star dinner for two at element 47, opening or closing with element 47’s signature vintage of Pierre Gimonnet Champagne from France. Happy Valentine’s Day from The Little Nell.